Marketing warfare for creatives? Are we talking about creatives enlisting in the army? Not at all… but read on! The flank is taken from military warfare and applied to marketing as a tactic to sidestep the competition to take an offensive advantage or gain market share. 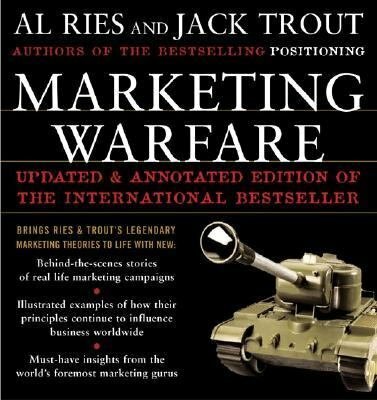 In Jack Trout and Al Ries’ book “Marketing Warfare”, they discuss specific marketing tactics based on their Positioning concept/ strategy. In an overly simplistic view, it can be very loosely perceived as doing the opposite of what the competition (everyone else) is doing. In marketing, going head to head with the competition is never a good idea. All parties generally take big hits even if one comes out on top. It is a drain on resources, time, brand name and morale. The same goes for mix martial arts fights. Two strikers (boxers or kickboxers) who go head to head strongly with strikes end out hurting each other and themselves. They each land strikes which are damaging but it also takes a lot of effort to deliver strikes and hurts the hands. That is why mixed martial artists are excellent flankers. A flank in the fight would be when one fighter side steps the other and delivers a throw, grapple and take down and locks in a submission hold. He wins and neither fighter gets hurt as much. Jackie Chan did a classic flanking move to stand out from the rest of the Kung Fu action stars and stuntmen. He often recounts his approach to differentiate himself in the seventies at the beginning of his career. In the era where Bruce Lee was reigning supreme by bringing Asian martial arts to mainstream movies and pop culture, everyone was trying to be Bruce; resulting in multiple clones (wannabes) of the master. Jackie flanked everyone by doing the opposite of what Bruce Lee did. While Bruce was the tough action hero, Jackie always portrayed himself as the often hapless and reluctant hero. Bruce Lee always kicked high to show off his skills and flexibility, Jackie always kicked low. Bruce always ended his punches with an aggressive battle cry. Jackie would grimace in pain and shake his hand. His flanking move of combining physical comedy with martial arts paved the way to his success; not discounting his talent, hard work and technical skills. Flanking is a guerrilla marketing tactic and is also explored aggressively by Joe Conrad Levinson in his Guerrilla Marketing book series. The guerrilla marketer is one who is often mobile and has limited resources and manpower. Therefore, a large percentage of marketing tactics tend to be flanks to circumvent the position of the competition. While guerrilla marketers used to refer to new upstarts and small businesses, even larger business with individual business units have to employ guerrilla marketing warfare in the current ever dividing highly segmented marketplace. Flanking as a marketing tactic, however, is easier said than done. While you strive to do the opposite than the rest of the marketplace, you need to ensure that you are still operating within the limits of commercial appeal otherwise you will be seen as deviant and be rejected by the larger segment of the marketplace. While you might amass a small cult following, depending on your locality, if might not be enough to be successful at the level you desire. Sometimes you need to execute a marketing flank on yourself to keep your innovative edge. Gillette is famous for flanking themselves as a defensive marketing move and to retain innovation leadership. As a creative, you have to find a way to flank your direct competition. Some creatives have it; that natural artistic eye and flair that gives them the coveted ability to create fresh new artistic products. This can be referred to as pure creativity. The good news is that being different does not mean you have be a pure creative artiste. You can be different in any way that is of value in the marketplace. You can be innovative in the way you present your creative product, apply your art to a specific market, introduce your creative product to untapped markets or even market yourself. So, the question is: “How do I know if I am different or what I do is different?” I have a simple test that I call the intuitive test. Follow what your gut tells you when you watch something. For example, if you are watching the performance of a singer; ask yourself these questions. Does anything feel familiar? Which parts of the performance reminds of you of someone else’s (or everyone else’s)? Does the dressing, style or image feel different or a “copy” of what other popular successful artistes are showcasing?